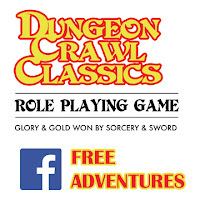 Recently Dungeon Crawl Classics, from Goodman Games, had a Facebook contest where if they got 1,500 "Likes" they would offer up two free adventures. The Jeweler that Dealt in Stardust, a level 3 heist where clever thieves can excel. The second adventure is #66.5 Doom of the Savage Kings, which was a level 1 adventure that was briefly given away for free with a DCC purchase or was available independently for $10. It is a 14 page adventure with three pages of pretty cool maps. 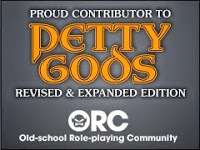 Even though it is a level one adventure, you might find it suitable for smaller parties of higher level PCs. I won't provide a direct download link, but you can get it from the Dungeon Crawl Classics Facebook Page (look for an April 8th, 2013 post). You should send them another "Like" before downloading.